Preface: This is a recent arrival from the folks at Merchant du Vin. It came accompanied by a bottle of Cherry Ale and Raspberry Ale. The decision to taste the Strawberry was made because the Raspberry was too cold to appreciate. 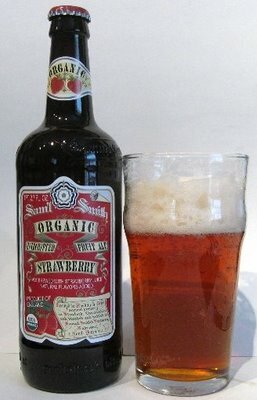 This bottle of Strawberry Fruit Ale was opened at cellar temperature. Before I get to the actual tasting I must note that fruit beers are not my favorite brews. However, all beers have a time and place. Appearance: It looks like traditional ale but it smells all of strawberry… The brew is crystal clear and topped with a very fragile head of tan bubbles of impressive dimension. Flavor: Between lip and sip there was hint of berry but not unpleasantly so… the first cool impression is then filled with a rather authentic flavor of ripe strawberries. The berry flavor is spiked with a carbonation that starts out creamy and then lends that flavor of sharp almost citric character. The second sip revealed more of the creamy sensation and less tang. The final swallow was less than perfectly balanced. Finish: The final flavors are fresh and fleeting… there is only a touch of the berry left in the end. Comments: The temperature that this brew was served probably could have been on the colder side. This would have settled down the carbonation and let the fruit develop from a cool place rather than springing out fully developed. This will be tended to when the other two bottles are tasted. Cream cheese and cucumber sandwiches would be a rather urbane accompaniment to this beverage.